Offering a fun and relaxing way to pay a visit to Bermuda, personal and chartered yachts are always welcome on our island, with all boats normally cleared to dock with a minimum of formality. With the ability to plan your own itinerary, there may be no better way to travel to Bermuda – provided, of course, that you plan your voyage carefully and check and prepare your vessel adequately before embarking on your trip. To make matters even easier for you, visitors arriving via yacht can stay in Bermuda for up to 90 days without the need for a visa, making long vacation layovers a breeze when visiting our island. In order to stay for longer than 90 days, each landed yachtsman must apply at the Bermuda Department of Immigration. Given the high amount of sea traffic that makes its way to our island each year, Bermuda is well-equipped for yacht traffic, with lanes of approach clearly marked and assistance available at all times, helping to provide you with the peace of mind that comes with knowing that when you visit our island, you’re visiting friends. In order to ensure that you have a smooth entry into Bermuda when you arrive, it is advisable to file details of your voyage, including a vessel description, safety equipment list, and crew information with RCC Bermuda/Bermuda Radio prior to commencing your voyage. You can visit the RCC Bermuda website in order to complete a standard pre-arrival form online [link here] or, alternatively, you can call RCC Bermuda directly at 441-297-1010. 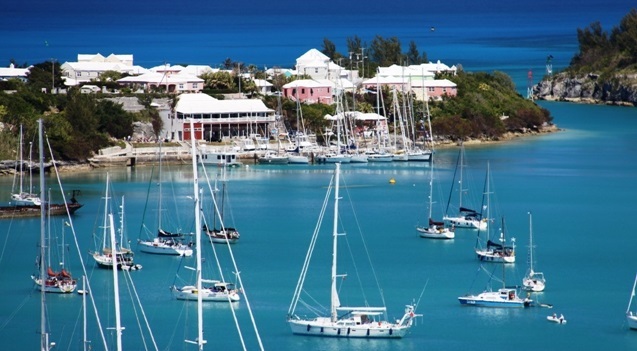 All visiting yachts are required to obtain clearance in St. George’s before proceeding elsewhere on the island, with the Yacht Reporting facility in St. George’s being the only clearance port for arriving and departing yachts in Bermuda. This clearance facility is located at the eastern end of Ordnance Island, and is depicted on the map above. Please note that an arrival tax of $35 USD will be levied for each person on board the visiting yacht.